An unknown assailant opened fire on a Jewish school in Toulouse on Monday, killing at least four people and wounding five. According to initial details, a man riding on a motorcycle opened fire on the Ozar Hatorah School at arond 8:10 am, as the students were arriving for the school day, and then fled the scene. The shooter reportedly used two weapons, one of which was automatic. The incident claimed the lives of Rabbi Jonathan Sandler, 30; his 3-year-old and 6-year-old sons, Gabriel and Arieh; and 8-year-old Miriam Monsonego, daughter of school headmaster Rabbi Yaacov Monsonego. A 17-year-old was seriously hurt in the attack. ZAKA's Paris headquarters sent representatives to the school to assist authorities. 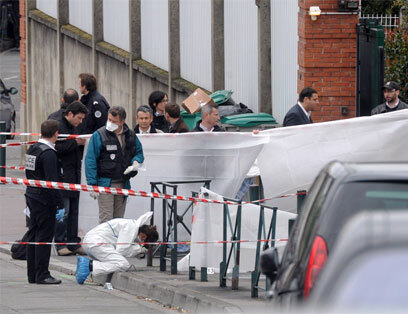 French Interior Minister Claude Gueant and French President Nicolas Sarkozy arrived in Toulouse at noon. "We are struck by the similarities between the modus operandi of today's drama and those last week even if we have to wait to have more elements from the police to confirm this hypothesis," Sarkozy said, calling the attack an "abominable, frightening tragedy." Paris has ordered an increase in surveillance and protection for Jewish institutions across France. 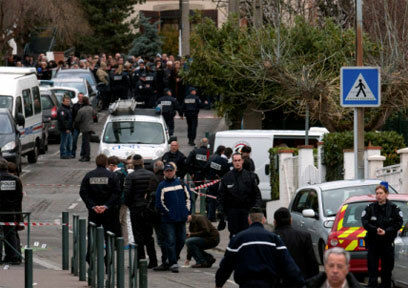 French anti-terrorism prosecutors announced that they will investigate the shooting. The Foreign Ministry in Jerusalem issued a statement saying that Israel was "horrified" by the attack. Foreign Ministry spokesman Yigal Palmor expressed outrage at the killings. "We are following with great shock reports coming from Toulouse and we trust the French authorities will solve this crime and bring those responsible to justice," he said. Chief Rabbi of Israel Yona Metzger also denounced the attack. "This was the brutal slaying of innocent people whose only crime was being Jews," he said. Prime Minister Benjamin Netanyahu added that "it is too early to determine what the background of the murderous act was, but it is impossible to reject the possibility that this act was driven by violent and murderous anti-Semitism. Chief Rabbi of France Gilles Bernheim expressed the Jewish community's horror at the incident. German Foreign Minister Guido Westerwelle condemned the shooting as well. "I am deeply shocked by this murderous attack", he said, adding that Berlin offers its "compassion and condolences" to the victims and their families. The shooting happened in the same region where a gunman on a motorbike opened fire on three uniformed paratroopers at a bank machine Thursday, killing two and critically wounding the other. The attack in the town of Montauban occurred not far from the soldiers' barracks. Four days earlier, a gunman on a motorbike shot and killed another paratrooper in Toulouse, about 30 miles away. French Ambassador to Israel Christophe Bigot told Ynet that he was "shocked and horrified to learn of this barbaric act in Toulouse. We all want to express our solidarity with the Jewish community in Toulouse. This issues is taken to heart at the gravest levels. "We of course want to express our empathy to the victims and assure our commitment to the safety of the Jewish community in France. We will find the man behind this barbaric act." The Conference of European Rabbis issued a statement saying the shooting was was a "barbaric event," adding that the Jewish community will not be threatened. The Jewish Federations of North America released a statement as well, expressing outrage at the incident. “Words cannot describe the shock and outrage – and deep mourning – that result from a terror attack that is specifically directed at children," the group's CEO and President Jerry Silverman said. "We have long known that Jews can be targets of vicious attacks wherever they are in the world. And it is clear, that even today, in 2012, that statement remains true." 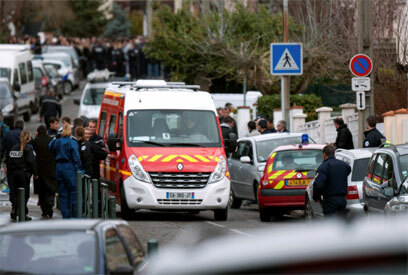 See all talkbacks "Four killed shooting outside Jewish school in Toulouse"